LOS ANGELES, April 10 (Xinhua) -- A ceremony commemorating the 48th anniversary of "Ping-Pong Diplomacy" was held Wednesday at the Richard Nixon Presidential Library and Museum in Yorba Linda, western U.S. state of California. 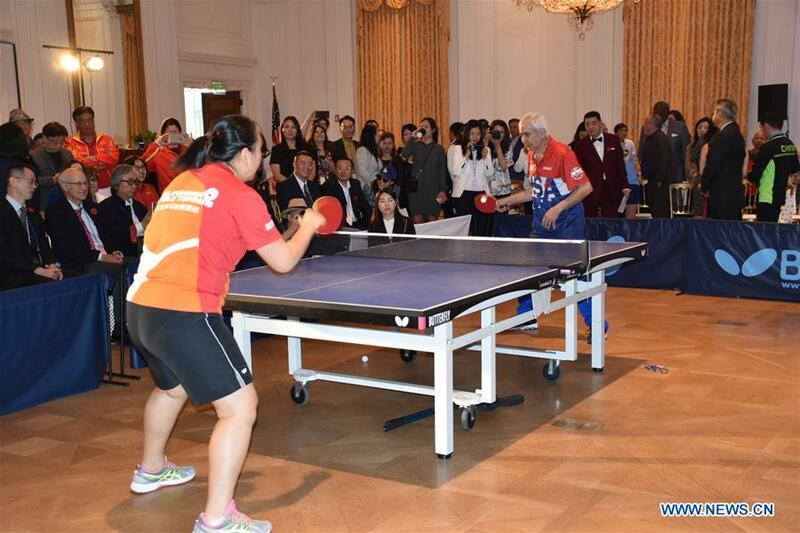 Hosted by the American Chinese Athlete Association (ACCA), "The 48th Anniversary of Ping-Pong Diplomacy &The 40th Anniversary of U.S.-China Relations" event has attracted hundreds of sports champions, community leaders as well as Chinese and American officials. "As a famous metaphor says, 'the little ball moved the big ball,'" said Shi Yuanqiang, deputy Chinese consul general in Los Angeles, noting that the historic "Ping-Pong Diplomacy" not only shortened the distance between the Chinese and American people, but also opened the prelude of the normalization and development of China-U.S. relations. Forty-eight years ago, the U.S. Ping Pong team made a visit to China on April 10. Just one year later, a group of world ping-pong champions from China paid a return visit to the United States. Normalization of relations between the two countries was gradually realized thanks to the "Ping-Pong Diplomacy," which created a new chapter of their bilateral relations. The hosting place of the commemoration was named after former U.S. President Richard Nixon, who made a historic visit to China in 1972 after the two-way ping-pong team visits. "I wish today's event a complete success and further growing of the friendship and cooperation between the Chinese and American people," Shi said in his speech. Peter Gao, the founder and president of ACAA, called on more sports and cultural exchanges between China and the United States. "Sports form a significant and valuable common bond among societies and open an important international communication channel," said Gao. "The ability of sports to bring people together is part of the reason 'Ping-Pong Diplomacy' works," he said, noting that sportsmanship breaks down the language barrier. Errol Resek, a witness and participant of "Ping-Pong Diplomacy", played a game at the commemoration with Gao Jun, a former world champion and member of China's national ping-pong team and current coach of U.S. Ping Pong Team, winning plaudits with their skillful performance. In 1971, Resek was the youngest player of the U.S. Ping Pong Team. He recalled his visit and matches with Chinese athletes, saying that he is very happy to take part in the commemoration. "I love ping-pong, it's the sport of my life... I love Chinese, my trip to China is awesome and unbelievable," he said, expressing his hope to visit China again in near future. The ACCA was established in 2015 in Los Angeles. It's a non-profit organization, currently with nearly 100 professional athletes, including 55 international-level and 33 national-level athletes.